Construction companies are growing more concerned about their risk exposure, with respondents reporting in a new survey that their “risk sentiment” has increased to 4.99 on a scale of 1-10 (it was at 4.44 in the spring of 2016). 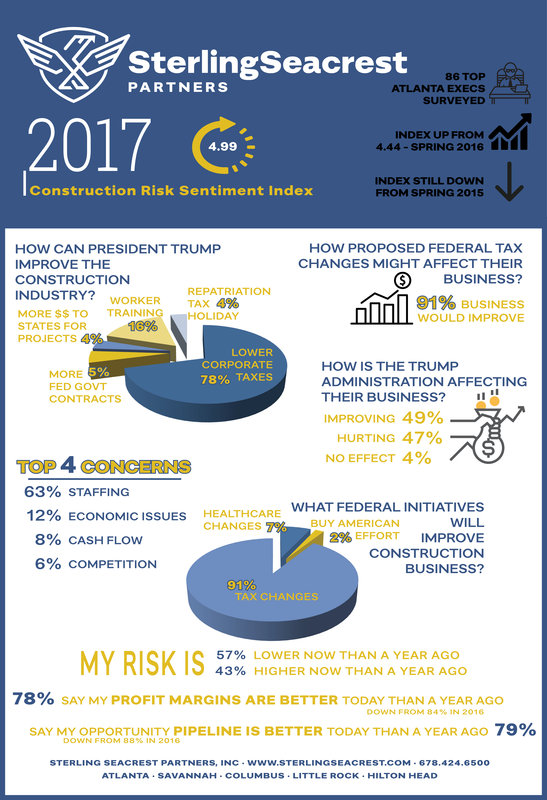 In the latest “Sterling Seacrest Risk Sentiment Index of the Construction Industry,” most report improving profit margins, but their concerns about staffing are increasing and remain the number one issue. Businesses were also surveyed about how proposed federal changes might affect their businesses. When asked how the Trump administration is affecting their business, 49% said it was improving, 47% said hurting, and four percent are not seeing an effect. When asked what they would like President Trump to do to improve the construction industry, 71% cited “lower corporate taxes,” with 16% looking for more programs to train workers in the industry. The top four issues in order of concern were staffing (63%), economic issues (12%), cash flow/financial (8%) and competition (6%). Issues construction industry executives feel least prepared to deal with right now include computer hacking and security and healthcare costs. 57% feel their company’s exposure for risk is lower than a year ago. 43% feel it’s higher. Methodology: The Sterling Seacrest Risk Sentiment Index surveyed 86 top executives in Atlanta’s construction industry using SurveyMonkey.com. The survey was conducted late fall 2017.